Parts of New England got hit with yet another wintry mix on Saturday. Mixed-precipitation was expected throughout the day. Winds were also expected to be strong in eastern and southeastern Massachusetts with a high wind warning expanded to Cape Cod. The heaviest snowfall was projected to be across northeast Massachusetts. MassDot said they had an estimated 1,600 pieces of equipment on the roads. In addition, the speed limit on the Mass Pike was lowered to 40 mph from the New York border to exit 11 in Millbury. Tim Phoenix, of Pepperell, was glad to see the snow. He said he was on his way to go skiing in Vermont. Parts of New England are getting were hit with yet another wintry mix on Saturday. "It's good to get another weekend of skiing in a nice April Fools. Will be fun I hope," Phoenix said. In New Hampshire, where up to a foot of snow was expected, hundreds of equipment was still on the roads in the early morning cleaning what fell overnight. 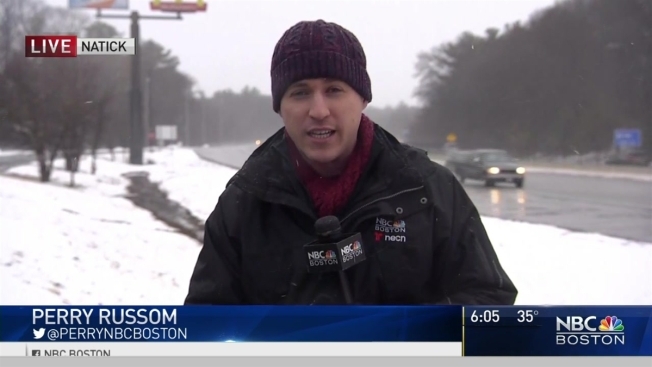 Many residents in the Granite State have mixed feelings on the spring storm. "Sidewalks are horrible. They could have done a little more cleaning on that," said Manchester resident Keith Carchide. "I guess they're doing the best they can. I usually get in a little early, shovel a little bit but we usually get a couple of kids get them to clean off the cars give them a few bucks make it easier." Manchester resident David Leonard, he said he’ll take the snow no matter what season. "A lot of people didn’t have a lot of work this winter because of the snow plowing and we had a late start so it’s good for everybody that’s got a plowing job to make that extra money before summer comes," said Leonard. "Doing landscaping there’s only so much you can do during the winter time so the snow makes it really worth it." Leonard said he planned to be out for at least 12 hours cleaning up the snow. Some baseball fans who traveled to Boston for the Red Sox opener were caught by surprise by the wintry mix. Jason Brady from San Diego says he came to the city very unprepared for the cold weather. “I had to go out and buy jackets just to get through the day,” he says. Daniel Sheehan lives in Boston and has experienced unpredictable New England weather first hand. Fortunately the sun is expected to shine for the Sox on opening day.